Try some hill rolling, explore short forest paths, pop out into pockets of grassy glades, and stumble across a picturesque pond. Walks through the park provide ever-changing vistas and it’s a wonderful place to explore or stop for a picnic. Kids can safely run all over the place in true pick-a-path style. A great spot for some form of hide and seek, or go-home stay-home! Matawai Park is an unusually designed park. Hidden away and covering 4 hectares, it reflects the native vegetation of Canterbury with examples of hill country, plains, and swamp vegetation. More than 25,000 trees have been planted since 1970. There are toilets at the King Street entrance. See below for a location map. We visited Matawai Park in August 2015 (winter). 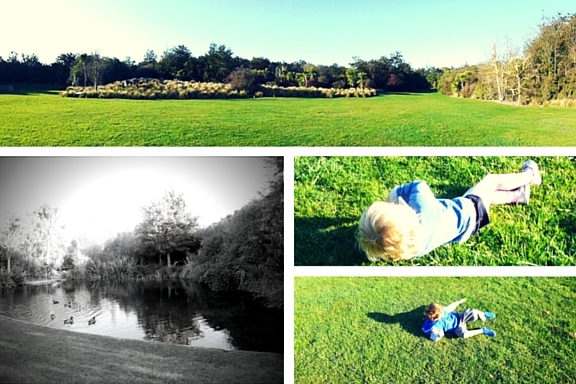 While you’re in Rangiora, visit Victoria Park (close to the town centre) for a play. See pictures and location map below. Matawai Park is located at 30 King Street, Rangiora. Stop for a play at the Victoria Park playground located close to the town centre (corner Percival and Queen Streets).